A lot about it on GLP. Was just going to post this! Could it be a terror attack? Can't think where else it could be except in the gulf of Thailand. Last edited by blackyblue; 08-03-2014 at 12:37 AM. Was last seen heading towards Kenyir Lake. My Hubby lives in KL Malaysia ,I will give him a call tomorrow to see what is going on ....very strange indeed . Last edited by grannie27; 08-03-2014 at 01:02 AM. This just happened ....connection ? He added that Prime Minister Najib Razak's government "faces the wrath of the people". Previous Flight 777 disaster. Numerology / Synchronicity at work? Or the one that crash-landed short of a runway at Heathrow airport in January 2008. In the history of aviation there has been over 777 flights and over 777 crashes so it's hardly surprising to find one which crashed, is it? Type "flight 888 crash" into google, and i bet you find one that crashed. Last edited by blackyblue; 08-03-2014 at 01:37 AM. 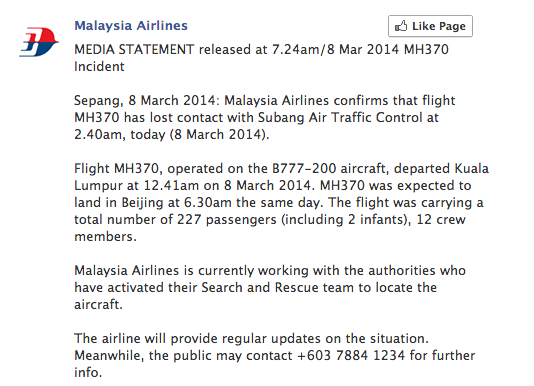 Malaysia Airlines VP tells CNN no distress call or problems reported from MH370 before disappearance, plane was at 35K ft. If it was a bomb debree would be scattered everywhere for miles and would not just disappear unnoticed. Last edited by blackyblue; 08-03-2014 at 02:00 AM. 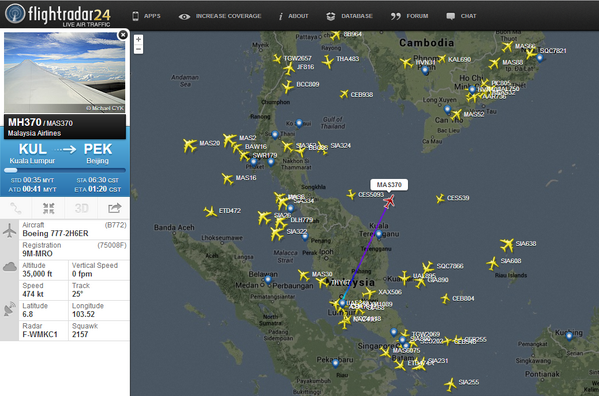 Flight 666 won't crash, it'll just affect trading. Last edited by underdenver; 08-03-2014 at 02:02 AM. Don't want to confirm this, but one of my friends in the ''know'' who gave me correct information about AF447 in 2009 just text me saying the track of the aircraft changed from 024 degrees to 333 degrees and the change in attitude from 35,000ft to 0ft in the space of a minute coupled with the change in track signifies a rapid uncontrolled descent - I really don't want to get into speculating what caused this but I thought I'd share the information, have to say it's devastating news - I really don't want to believe it frankly.